The American Revolution: Our Fight for Independence and Money of the Revolution. This chapter studies money of the American Revolution, placed in context of America's struggle for independence. Many illustrations, including images of the Revolution, Continental currency and Continental dollars, complete with descriptions. The "Coins & History Chapters" button at upper right opens up other units in our US Coins & History section. The links directly below are sub headings in "The American Revolution" chapter. Inspired by the boldness of the Continental Congress, many towns and villages in New England organized militias, comprised of minutemen volunteers, prepared to assemble at a moment's notice to take up arms in defense of colonial liberties. Growing evermore concerned, the British commander in Boston, General Thomas Gage, decided to seize a large cache of weapons hidden at Concord, Massachusetts, in hopes of preempting the brewing rebellion. On the night of April 18, 1775, Gage ordered 700 of his men to set out for Concord. Paul Revere, and his lesser-known compatriots, William Dawes and Samuel Prescott, rode off into the darkness to warn the sleeping Americans that the British were coming. Soon the peal of church bells echoed throughout the countryside, rousing the minutemen from their slumber to gather at their pre-appointed places. 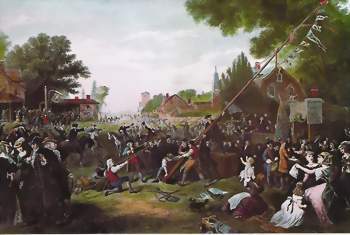 British troops firing into the crowd of minutemen at Lexington, April 19, 1775. One man, Jonathan Harrington (foreground) managed to reach home, dying in his wife's arms. Public domain image. At dawn on the next day, April 19, an advance patrol of British troops reached Lexington, five miles shy of Concord, only to be met by about seventy defiant minutemen clutching muskets. The colonists were ordered to drop their weapons and disperse. There is no clear record of what happened next, but someone fired a shot, followed immediately by a volley of gunfire by the Redcoats. Eight colonists were killed and ten wounded. After destroying a few insignificant targets at Concord, the British suffered 273 casualties on their return march to Boston, mostly at the hands of colonial militia concealed within their familiar surroundings. With "The Shot Heard Around the World" the War of the Revolution had begun. As promised, the Second Continental Congress met in Philadelphia in May, 1775. In spite of the bloodshed at Lexington and Concord, the majority of the delegates insisted some form of reconciliation with Britain was the proper course of action, with an understanding, however, that tyranny would be resisted. To express their resolve, they appointed George Washington of Virginia as commander in chief of the Continental Army. Common Sense became an instant best seller, and catalyst of the Revolution. Image courtesy of Library of Congress. Slowly, sentiment began to build for a complete separation from the British government. Bitterly fought battles at Ticonderoga and Bunker Hill, and King George III's arrogant refusal to consider any American proposals for reconciliation helped move public opinion in this direction. 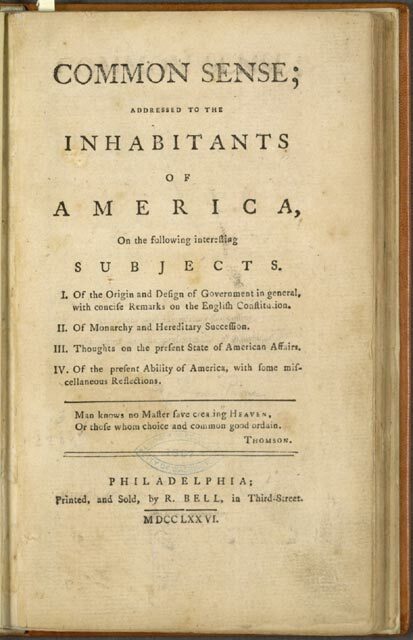 However, it wasn't until January 1776, when Thomas Paine published his pamphlet, Common Sense, that the spirit of independence began to take root. Paine convincingly laid out many reasons for complete autonomy, arguing that independence was the destiny of all Americans. 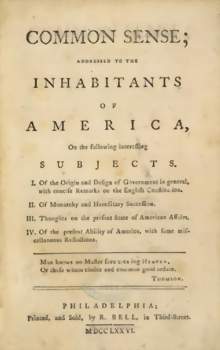 On June 11, 1776, the Second Continental Congress appointed John Adams, Benjamin Franklin, Robert Livingston, Roger Sherman, and a young Virginia lawyer with a reputation for talented writing, Thomas Jefferson, to a committee for the purpose of drafting a document declaring to the world the colonists' desire and reasoning for independence. On June 28, Jefferson and the committee presented the Declaration of Independence to the Continental Congress. Instead of debating the Declaration immediately, the delegates worked on another resolution for independence submitted a few weeks earlier, formally adopting it on July 2. The signers of the Declaration of Independence must have felt uneasy in doing so, for they were risking their lives, fortunes, and sacred honor by affixing their names to the document. Image courtesy of Library of Congress. The delegates then turned their full attention to Jefferson's document. Before accepting the Declaration, several references to the injustices of slavery were removed, in order to win the unanimous approval of the body. Finally, on July 4, 1776, the Continental Congress adopted the Declaration of Independence, going public with it on July 8. From that day onward, the Declaration became one of history's most cherished documents, its noble ideas inspiring freedom-loving people from all corners of the earth to strive for the highest ideals of humanity. Even before the Revolutionary War broke out, there were precious few coins circulating in America. Also extremely scarce was gold and silver bullion. How then, could the Americans pay debts incurred from fighting a war? 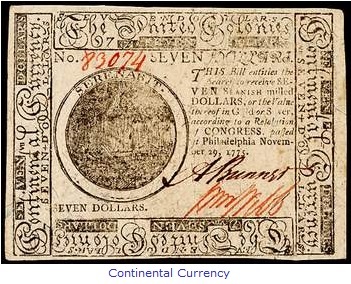 This 1775 seven dollar note is typical of the paper money issued by the Continental Congress to pay for the costs of the American Revolution. Due to over-issue and lack of confidence in the government, the notes became nearly worthless. Eventually, Congress redeemed them at 1/100th of their original value in bonds, not maturing until 1811. Image courtesy of EarlyAmerican.com. The only feasible solution to raise money was for the Continental Congress to issue paper money. Beginning on May 10, 1775 paper money was released in a wide variety of denominations, ranging from one-sixth dollar to 85 dollars. The odd denominations would help make change, or so the thought went. The Continental Currency notes were to be redeemable at a later date in Spanish milled dollars, also known as pillar dollars, or in some other precious metal specie. At first, the public readily accepted the Continental Currency, helping the notes to hold their face value. But as the difficulty of defeating one of the best militaries in the world began to manifest itself, the worthiness of the notes started to plunge. After all, how securely could a neophyte government back the paper money it printed? To make matters worse, Congress over-issued the currency, far in excess of any potential metal reserves, while British counterfeiters further contributed to the inflationary spiral. 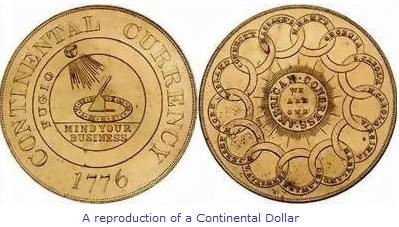 By March 1779, Continental Currency was valued at a 10:1 ratio against the Spanish pillar dollar. By 1781, the ratio had fallen to 75:1. The expression "Not worth a Continental" became slang to refer to anything (including, we suppose, a person) having no redeeming value. Continental Dollar reproduction (c. 1960) in brass. The obverse shows the sun's rays striking a sundial. Obverse legend includes FUGIO (Latin for "I Fly") and MIND YOUR BUSINESS. Reverse has and endless chain, each link encircling the name of one of the colonies. Reverse legend states: AMERICAN CONGRESS: WE ARE ONE. Images courtesy of EarlyAmerican.com. The Continental Congress early on recognized the need for more coins. They planned to mint a Continental Dollar to symbolize American sovereignty, to serve as backing for Continental Currency, and hopefully, to improve morale. Pattern Continental Dollars made of brass, pewter, and silver were struck. Silver bullion from France, sufficient to produce large quantities of the Continental Dollars, was promised soon. Because Congress was so certain the introduction of the Continental Dollar would be a success, printing of one dollar notes was cancelled for 1776 and 1777. Unfortunately, the silver shipments never arrived, so very few Continental Dollars actually reached the general population. The Continental Currency system was plagued by many shortcomings. It's a miracle the American patriots were able to finance an army at all during the Revolution. Nevertheless, Continental notes represented the first unified currency system to be established in America, leaving behind a fascinating legacy for today's historians. To learn more about the paper currency from colonial times to 1800, we suggest getting a copy of Early Paper Money of America. Wonderful pictures. Great descriptions. Good transcriptions of hard-to-read writing on the notes. Worth every penny! The raising of a Liberty Pole, a tradition during the revolutionary years. Liberty Poles or Liberty Trees were erected where colonists gathered to hear patriotic speeches or to send sons off to war. Image courtesy of Library of Congress. Most observers expected the revolution to be put down quickly. A colonial population of about 2.5 million people, many of whom remained loyal to the British crown, stacked against a nation of 10 million boasting the largest, best trained army and navy in existence, seemed like a mismatch. Still, the British faced a key obstacle: The Atlantic Ocean. In addition, the Redcoats would have to fight in an unfamiliar wilderness, totally unlike anything they had experienced in the open battlefields of Europe. As we shall soon see, this proved to be a crucial advantage to the Americans. Not long after the Declaration of Independence was enthusiastically adopted, General George Washington and his Continental army suffered a serious defeat at New York, loosing control of the largest American city and its harbor to the British. Thanks to clever evasive tactics, Washington saved his men from total annihilation at the hands of a vastly superior force. Throughout the remainder of 1776, disaster after disaster hammered away at American hopes. Battered and beaten, Washington and his remaining 8000 troops slipped away across the Delaware River into Pennsylvania in the late fall of 1776 to regroup. The winter encampment was a dismal time for the Continentals. Even the normally optimistic Washington was dispirited, writing "I think the game is pretty near up". Enveloped by despair and doubt, desertions and disease inflicted a toll on the Americans. One bright spot was Thomas Paine's The Crisis, a publication expressing gratitude to the soldiers remaining loyal to the Revolution. "These are the times that try men's souls", wrote Paine, and it became a great rallying cry at a moment when all seemed lost. 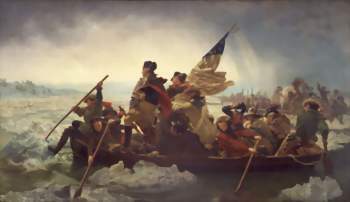 This famous painting by Emanuel Leutze captures the historic moment when General George Washington led the American revolutionary troops across the Delaware River, surprising the Hessians at the Battle of Trenton on December 26, 1776. The dramatic image of Washington leading his troops to victory conveys an emotional and patriotic message to all who love America. Public domain image. Washington knew some kind of victory was needed to revive morale and show everyone that the Americans could still fight with resolve. At that, he decided to bet everything on one bold surprise attack. On the very cold Christmas night of 1776, Washington and 2400 of his men quietly crossed back over the icy Delaware River to the New Jersey side, and marched nine miles to Trenton, where over 1000 Hessian troops were sleeping off their Christmas excesses (Hessians were Germans paid by King George III to fight against the colonists. Many of the 30,000 eventually serving in America came from the province of Hesse-Cassel, hence the name "Hessians"). Attacked at sunrise, the Hessians were completely surprised, being routed in minutes. When British reinforcements rushed to the Trenton area, Washington deceived the opposition into believing his army was stationary by leaving their campfires burning brightly. While the British were preparing to attack an empty campsite, Washington sped to Princeton and defeated a group of British regulars in early January, 1777. With these two impressive victories, the American spirit was reborn. During the next few months, volunteers joined the Continental Army at a solid pace. Washington's big gamble had paid off. "Gentleman Johnny" Burgoyne influenced London to attack New York from Canada. Traveling with his four post bed and fine wines, Burgoyne was not prepared for what he found in the rugged American landscape. Image courtesy of National Archives. In 1777, the British War Office in London developed a plan they thought for sure would put an end to the American rebellion. The plan was to split the colonies in two by controlling the waterways between New York and Montreal. Three armies were to be involved in a joint venture to make this happen. One force, under General William Howe, was to move north out of New York City and take Albany and control of the Hudson River. A second detachment, led by Colonel Barry St. Leger, was ordered to proceed east toward Albany from Lake Ontario. The largest deployment, under the command of General John Burgoyne, was to travel south of Montreal, take Lake Champlain, and rendezvous with St. Leger and Howe at Albany, where they would combine to strike the final death blow against the American rebels. Unfortunately for them, the maps of the London war planners did not provide information on the terrain the British military would have to overcome. The pencil lines directing troop movements, in reality, represented treks through swamps, mountains, and dense forests, all swarming with sharp-shooter militiamen prepared to give their lives in defense of their homes and country. British general John Burgoyne hands over his sword to American General Horatio Gates, on October 17, 1777, at Saratoga, New York. 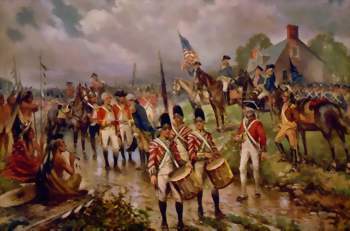 The American victory was the pivotal event of the Revolution, convincing European observers the underdog rebels might actually defeat the mighty British. A few months later, France openly agreed to provide badly needed assistance to the upstart Continental Army. Image courtesy of Library of Congress. For reasons that remain unclear, Howe led his force south toward Philadelphia, without the knowledge of Burgoyne or St. Leger. After several victorious engagements against Washington, Howe seized Philadelphia in late September, 1777. St. Leger, moving eastward from Lake Ontario, encountered resistance at Fort Stanwix, but completely reversed course when word came of a rapidly approaching large column of troops under the command of General Benedict Arnold (this was before his treason). Of the three British officers scheduled to link up at Albany, only Burgoyne got close to his destination, but this turned out to be a disaster for him. Burgoyne started southward from Montreal with about 8000 men, but he was not trained to lead such a large expedition through a forested wilderness. Felled trees by American axmen and other obstacles slowed his progress to a crawl. Motivated patriots from all over New England were gathering in New York and clashed frequently with Redcoats, sometimes inflicting heavy casualties at little cost to themselves. By the time Burgoyne reached Saratoga, New York (less than 40 miles north of Albany) his situation was extremely serious. 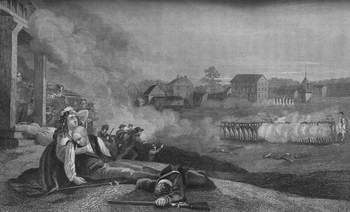 His munitions nearly gone, his supply lines severed, and with no reinforcements to join him, Burgoyne found himself surrounded by 20,000 American soldiers under the command of General Horatio Gates. Realizing he had no choice, the British general surrendered his remaining 6000 men over to Gates on October 17, 1777. The victory at Saratoga proved to be the pivotal event of the American Revolution. As crucial as the triumph at Saratoga was logistically, the loudest reverberations were heard in Paris and other European capitals. The French had been sympathetic to the plight of the Americans, and in fact, had been secretly providing badly needed materiel from the beginning. Now that the Continentals had demonstrated the possibility of upsetting Great Britain, the French were eager to openly support the revolution, in hopes of humiliating their arch enemy across the English Channel. Washington and Lafayette, concerned for the well being of the poorly clothed soldiers at Valley Forge These two leaders greatly respected one another. After the war, Lafayette returned to America on several occasions, receiving a well-earned hero's welcome each time. Image courtesy of National Archives. Largely through the diplomatic charm of Benjamin Franklin, France committed itself to send gold, gunpowder, shot, equipment, ships, and troops to supplement the American forces. The most famous French contributor to the liberation of America was, of course, Marie Joseph Paul, better known as the Marquis de Lafayette, who had been serving loyally at Washington's side even before the Franco-American alliance was officially formed. In addition to France, Spain and the Netherlands now supported the Americans. Volunteers from other European countries came to offer assistance also. From Prussia (modern day Germany) came Baron Friedrich von Steuben, and Casimer Pulaski and Thaddeus Kosciuszko, both of Poland. 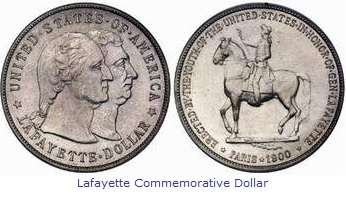 Lafayette's service to America is honored on this commemorative $1.00 coin released in 1900, appearing next to George Washington. The figure on the reverse is similar to the statue of Lafayette erected in Paris, as a gift to France from the American people. Photo courtesy of Ira & Larry Goldberg Coins & Collectibles, Inc., Beverly Hills, CA. Brilliant military strategists all, these officers helped transform the Continental army into a cohesive unit of professional soldiers, and participated in the formulation of effective defense operations. Even with the French alliance, the next several years produced little more than a stalemate. Seemingly, every step forward (George Rogers Clark's clearing the Northwest of British forces, a big win against Tories at Cowpens, South Carolina, and the widespread waging of a successful guerilla warfare campaign against British troops) was offset by a stunning setback elsewhere (disheartening winter at Valley Forge, the loss of 5500 men captured at Charleston, South Carolina, and ceding several southern states back over to British control). Through all the uncertainty and misery, George Washington remained the strong, devoted leader, admired greatly by those whom he led. Had a man of lesser abilities been in charge, the entire American dream of independence might have collapsed. Finally, a combination of circumstances aligned themselves to break the stalemate. An army of 6000 Frenchmen landed at Newport, Rhode Island in the summer of 1780, and joined up with Washington at White Plains, New York. Together, they harassed the British military occupying New York City, then under the command of General Henry Clinton. The next year, Washington got the message he had been waiting so long the hear: A powerful French naval fleet was on its way to America! Meanwhile, General Lord Cornwallis decided to move his Redcoats northward into Virginia, basing himself at Yorktown, located just a few miles from Jamestown, the first successful English settlement in the New World. Cornwallis was supplied by the Royal British navy operating out of New York harbor. The surrender of British forces at Yorktown, by eyewitness John Trumbull. British General Lord Cornwallis was not present. Apparently too ashamed, he sent his second in command, General Charles O'Hara. 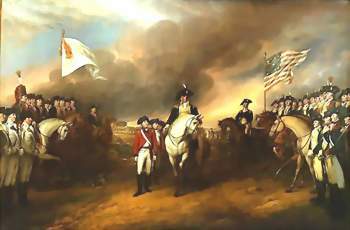 General Benjamin Lincoln (on white horse) receives the surrender, after O'Hara tried to capitulate to the French on the left. George Washington is on horse, to left of American flag. As marching British soldiers put down their arms, a band played "The World Turned Upside Town". The victory at Yorktown, for all practical purposes, ended the American Revolution. Image courtesy of The Architect of the Capitol. Following Washington's instructions, the French fleet positioned itself at the mouth of Chesapeake Bay to form a blockade, depriving Cornwallis of his supply line. In August, 1781, Washington faked an attack on New York, to deceive Clinton into believing that a major assault on the city was imminent, then made a mad dash to the northern shores of Chesapeake Bay, where his army embarked on transport vessels headed south to Yorktown. By September, Washington had amassed 15,000 troops surrounding Yorktown, while the French navy was busy defeating a British naval contingent sent to relieve Cornwallis. For the next month, the noose tightened around the British position. Realizing he was hopelessly trapped, Cornwallis surrendered his entire army of 7000 men on October 19, 1781. 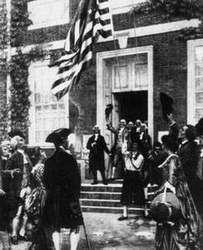 Jubilant patriots raise the flag at Independence Hall in Philadelphia, where the quest for liberty began in 1776. Americans today owe much to those brave men and women who risked everything and sacrificed much to launch our country. Image courtesy of National Archives. Yorktown was the last major conflict of the American Revolution. After the defeat at Yorktown, it was obvious to everyone that Great Britain would never again control her former colonies. An army of farmers and shopkeepers, long snubbed by British elitists as mere peasants, had defeated the most powerful empire on earth. Thanks to the skillful negotiating team of John Jay, John Adams, and Benjamin Franklin, a peace treaty was signed in September 1783, when Britain formally acknowledged American independence. For the first time in history, a colonial population had successfully broken free from its mother country. In its place, a new nation was born where the concept of individual liberty and representative government was established, eventually to become the model worldwide for those seeking freedom from oppression. 1 Allen, Jack, and John L. Betts. History: USA. New York, NY: American Book Company, 1967. 2 Brinkley, Douglas. History of the United States. New York, NY: Penguin Putnam, Inc., 1998. 3 Doty, Richard. America's Money, America's Story. Sydney, OH: Amos Press, Inc., 1998. 4 Newman, Eric P. Early Paper Money of America. Iola, WI: Krause Publications, 1997. 5 Schwarz, Ted. A History of United States Coinage. London, England: A.S. Barnes & Company, Inc. 1980. 6 Jordan, Winthrop D., Miriam Greenblatt, & John S. Bowes. The Americans. Evanstan, IL: McDougall, Littell & Company, 1988.